The following is an in-depth review of the online bookmaker, Sportsbet. Sportsbet is a popular Australian bookmaker that came onto the scene in 1993 and was Australia’s first bookie. Matthew Tripp had paid $250,000 for the Northern Territory licensed bookmaker in 2005. In 2009, Irish bookie Paddy Power purchased Sportsbet, but it continues to operate using the same name. If you enjoy having a punt on the horses or dogs there is no better online sportsbook than Sportsbet.com.au for Australian customers and the racebook is integrated into their sportsbook, so you can easily bet on everything under the one roof. This Aussie online sportsbook boasts more than half a million customers and for a good reason. As a punter, you just want to be able to place bets when you fancy having a flutter either on a desktop, laptop or mobile device using an easy-to-use interface and not have any limitations. Online sports betting couldn’t be easier with Sportsbet’s comprehensive online betting platform which is intuitive and easy-to-use. 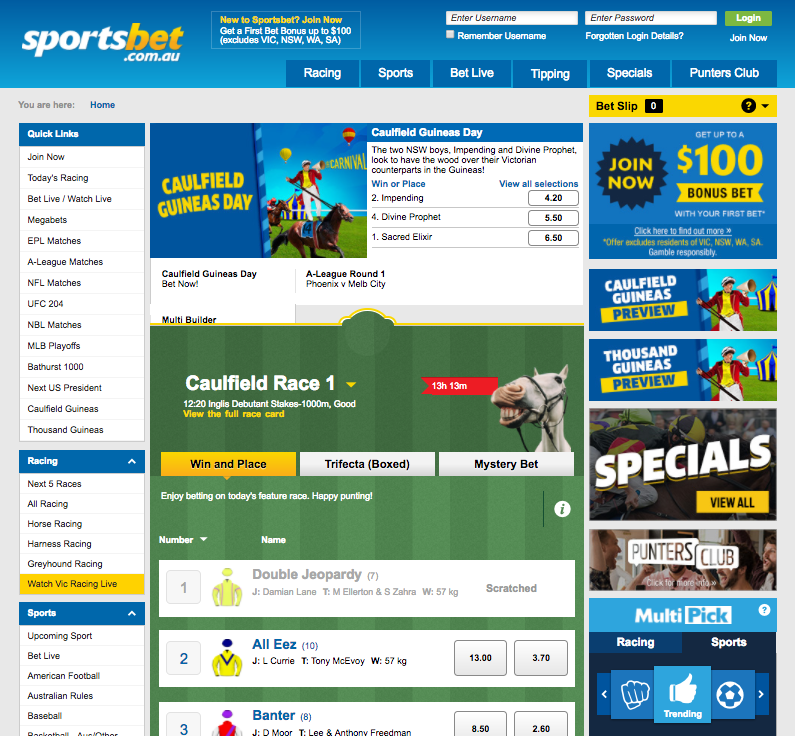 Sportsbet’s online sports betting platform uses the typical three-column layout and provides access to Sports and Quick Link options in the left navigation, markets and odds for upcoming sports and racing events in the center column, and the betting slip in the top right of the site. The odds are displayed in decimal format (e.g. $2.00) which is what you’d expect from an Aussie bookmaker. Simply enter the amount you’d like to wager and the returning payout is displayed right in the bet slip for you to see. If you make multiple bets, you’ll be asked if you would like them as single bets or to include them in a multi. Sportsbet’s $501 First Bet Match sign-up bonus is definitely one of the largest welcome bonuses in the industry. This welcome bonus offer is a fantastic way of boosting your sports betting bankroll to increase your chances of winning money. The welcome bonus and other promotions are displayed prominently on the homepage, so you will never have to miss out on any free money. This Australian online sportsbook also has a Refer-A-Friend bonus for referring mates to the site. Sportsbet covers sports and horse racing events all around Australia, offering odds on pretty much all sporting events in Australia and abroad, including thoroughbred racing, greyhound racing, harness racing, Aussie Rules, Rugby League, Rugby Union, Soccer, Baseball and many more each and every day you want to get on the punt. Almost any sport bet you can think of is offered to Sportsbet.com.au punters. Not just local professional sports competitions, but major sporting events globally such as American Football and the English Premier League – meaning you don’t need to sign up at another bookie to place a bet. There are form guides for all the sporting events and races available to bet on, which includes a graph on previous performances to help with making your selection. Live betting on a select number of events is another popular feature on offer at Sportsbet.com.au. But due to the live betting laws in Australia, you can’t bet on live sports online – it is only possible over the phone. However, somehow Sportsbet has managed to find a loophole in the law, and given punters access to live in-play betting on a mobile, without the need to speak to a customer service representative. This is possible through Sportsbet’s new Bet Live feature built into the site. Simply browse any live betting market on a mobile phone and confirm your bets during the game. Punters Club is a recent addition at Sportsbet which enables mates to bet together. This saves the hassles of having to manage a club elsewhere when it can all be done in the Sportsbet website. Sportsbet offers mobile betting, too. The Sportsbet mobile app is available for most devices. They have a mobile betting app for iOS and Android that you can download. However, if you visit their site on your mobile, you can also visit their sportsbook. You should have no issues placing a bet on your phone while watching a sports game. Live streaming of major sports events like Tennis, Golf, Basketball, Cricket and F1 among others is offered on Sportsbet’s main betting website and mobile platform, and anyone with an active betting account can watch the live sports streams. Sportsbet offers its punters a myriad of funding options, including deposit options such as credit/debit card, PayPal, POLi, Skrill and direct transfer from a bank account. Withdrawals can be handled via bank transfer or Skrill, so it is a painless process to get access to your cash. It might take a day to have your withdrawal request processed.